This user friendly corded phone has 6 large one touch picture memory buttons. Simply save the phone number to one of the 6 buttons, then place a photograph of the person whose number is saved underneath the protective cover. That photograph then identifies your one touch dial button. The Care 80 also features an amplified receiver, extra loud ringer and is Hearing aid compatible. 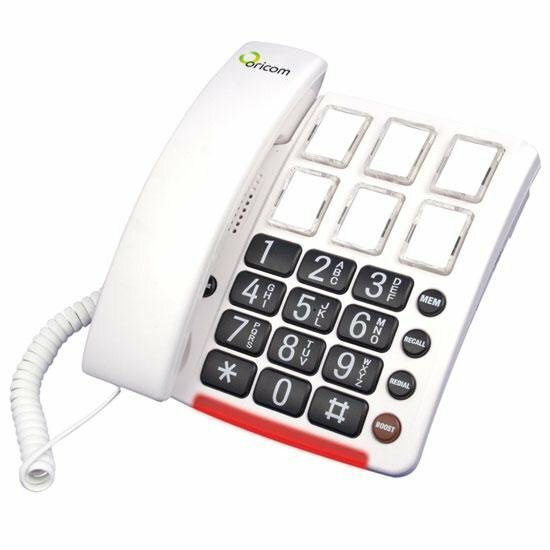 Add to this a large high contrast keypad, bright visual ring indicator and you have a perfect phone for persons suffering from memory loss, moderate to severe hearing loss and or low vision. Features: -6 One Touch Picture Memory Buttons: Allows you to insert a photo of the person in to the memory buttons so you see who you are calling without needing to remember the number. -Amplified Receiver: Allows you to adjust the volume in the earpiece to a higher level for comfortable listening. (Up to 24 dB) -Extra loud Ringer: Ensures that you can hear your phone ring from any room in the house. (Up to 90dB) -Hearing Aid Compatible: The phone contains an inbuilt inductive coupler which offers Hearing Aid users clearer sound. Simply switch your hearing aid to the “T” setting to use this function. -Large Contrast Keypad: Makes dialling a number easy, even in low light situations. -Visual Ring Indicator: A red light flashes on the phone to alert you of an incoming call. Great in noisy environments or for uses who are hearing impaired. -Wall Mountable: Mount on your wall for greater convenience. The Oricom CARE80 Phone was added to the Phones category in June 2016. The lowest price GetPrice has found for the Oricom CARE80 Phone in Australia is $74.95 from Gadget City.